“The government will, in the coming months, establish the Department of Energy which will be housed in the Ministry of the Presidency,” government said. Trotman said the department will be “focused only on the development of the petroleum sector”, based on a proposal that he made to President David Granger last year. 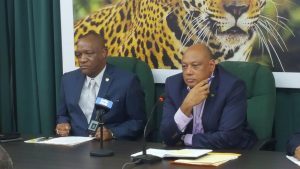 “Eventually, the expectation is that the Ministry of Natural Resources will hand over responsibility of the function of petroleum to this department and we will see a more direct and focused mandate from this Department of Energy and we will, of course, as a Cabinet be supporting the Department,” Trotman said in a video release through government’s Department of Public Information. The decision was made at Cabinet’s meeting on Tuesday at a time when government continues to come under intense pressure in certain sections of the media, civil society and the political opposition about the low two percent royalty and US$18 million signing bonus that government got in a revised 2016 Production Sharing Agreement with the ExxonMobil-controlled Esso Exploration and Production Guyana Limited. Minister Trotman has reportedly been appointed head of the Task Force which will be responsible for submitting to Cabinet a proposal on how the Department of Energy is to be structured and staffed. “This Task Force will be meeting and will make a proposal to Cabinet as to how the new Department of Energy will be comprised, staff and what its mandate will be,” Trotman said. “The Task Force will also comprise other ministers of government,” said government in the brief statement. Trotman said the Task Force, which now includes Minister of Finance, Winston Jordan; Minister of State, Joseph Harmon; Minister of Public Infrastructure, David Patterson and the Minister of Natural Resources, would be expanded. Those to be added are Minister of Public Security, Khemraj Ramjattan; Minister of Public Telecommunications, Cathy Hughes and “hopefully” Minister of Education, Nicolette Henry and Minister of Social Protection, Amna Ally. Sources said the establishment of the Department of Energy and the Task Force could take as much as six months. That entity, the Ministry of the Presidency said late Tuesday night, would be tasked with negotiating oil contracts and the issuance of licences among other duties. Key among those was the proposal by Trotman in his document that “all policy matters, including, but not limited to, the negotiating and entering into contracts, and issuing of licences for exploration and production, be transferred/re-assigned to the Ministry of the Presidency and placed within a Department of Energy and Development.” The proposal document submitted to Cabinet by Minister Trotman stated that “given the evolving macro-economic and national security considerations, and the transformative nature of the imminent production of petroleum,” it is his view that several matters must be taken into consideration. The President has in the past calmly shifted ministerial portfolios in a similar manner, resulting in the creation of the Ministry of Public Telecommunications and the transfer of Tourism from Cathy Hughes to Minister of Business, Dominic Gaskin. The decision by Cabinet that the Ministry of the Presidency must take over responsibility for oil and gas came weeks after President David Granger’s adviser on petroleum, Dr. Jan Mangal publicly criticised the Guyana -ExxonMobil agreement. Minister Trotman has publicly defended the deal, saying that it was better than the one that then President Janet Jagan had inked because Guyana was now entitled to two percent royalty than zero and that the concession rental had increased from US$240,000 to US$1 million per year. Provision was also made for a corporate social responsibility, and education and training at US$300,000 each per year. The revised ExxonMobil deal provides for a 50 percent share of profit oil that will in reality work out to 12.5 percent of the overall 100 percent. Cost Oil is calculated at 75 percent. The Minister has also said that the agreement had to take into consideration the political, investment and security risks.